Admit it: grammar often doesn’t seem to make sense, and sometimes the answer to “why?” is “just because.” This question, however, has an answer, which I will tell you a little further down. Take after (be like): I take after my father. I take my father after. Take off (remove): I take off my coat. OR I take my coat off. So how do we know? Look at the two examples above. In the first one, I are not really “taking” my father. If you say “I take my father” it is totally different from the meaning of “take after”. However, in the second one, “I take my coat” makes sense. The preposition just tells how we take it, in this case “off”. Show up means “to appear”, as in “My father showed up at my school.” This is inseparable because taking the preposition “up” away totally changes the meaning. Show off (display to make people envious), as in “I showed my new car off” is separable because it still has to do with showing something: the preposition only tells how it was showed. 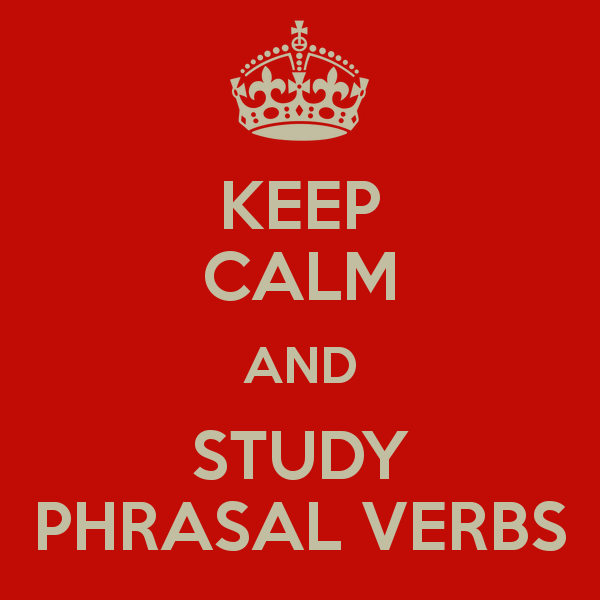 Here is a list of phrasal verbs and if they are separable or inseparable. Does this help clarify things? Tell me in the comments or point out exceptions to this rule, if you see any. Anything is okay. Also, email me at intensiveenglishprogram@uiu.edu if you have any other grammar problems you want me to explain. 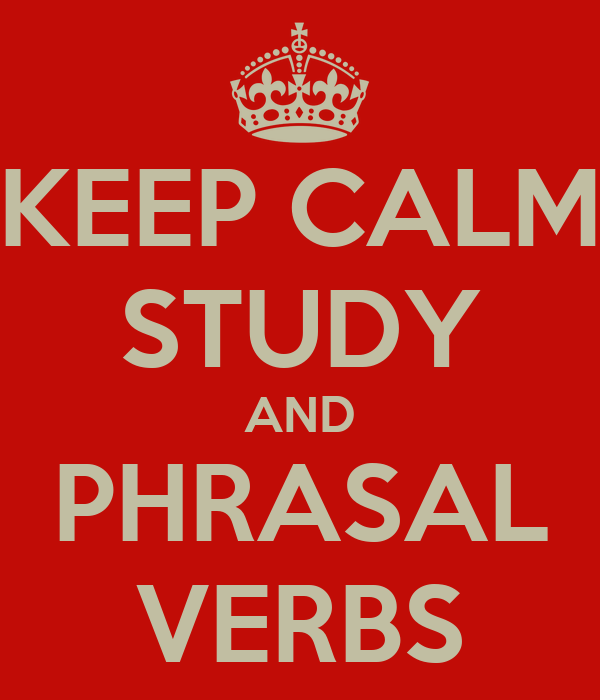 My impression is that the biggest mistake is to “teach” phrasal verbs starting from a grammar explanation. I’ve been an English teacher for 24 years and in my experience they should be picked up naturally. First of all, teachers have to make them part of their active vocabulary. Knowing them isn’t just good enough! If teachers draw on them on a daily basis and not just when it’s part of the lesson, students will be immersed in different contexts that will help take them in. 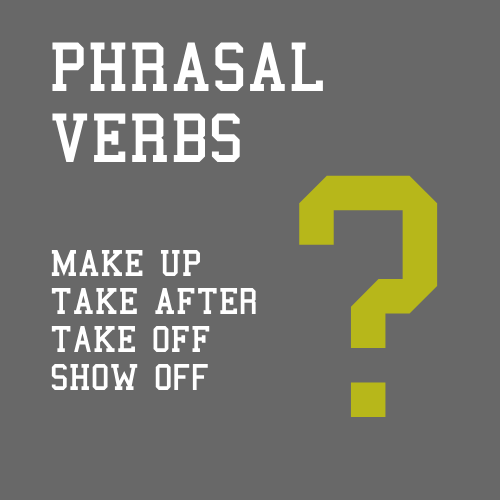 Apart from that, the amount of input plays a key role to learn phrasal verbs. There is a variety of sources to help students keep in touch with them. For instance, videos, Tv series, music, cartoons and comic strips have proved to be really useful and effective ( it could be time-consuming though!). 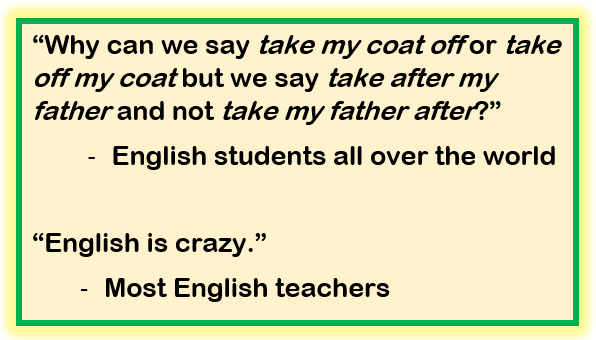 To sum up, teachers are the ones who should first change their attitude to phrasal verbs and their teaching approach. Additionally, exposing students to real English sources will lead them to end up not only undertanding them but also living them up to what is needed nowadays.